Yeo Tian Haw, the owner, is at the tender age of 21 years old, he started this stall with Zi Jian, his friend from childhood and both of them are of the same age. 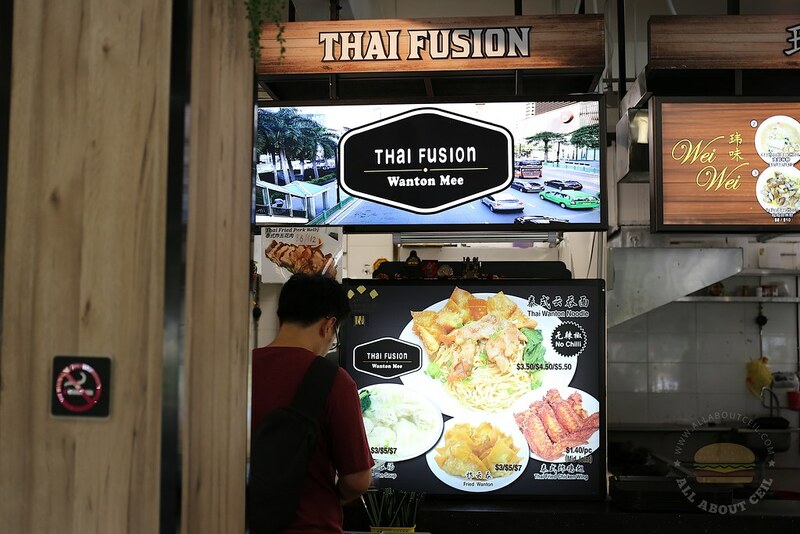 They have fallen in love with the Wanton Mee during their trip to Thailand and that prompted them to start this stall. There was a short queue when I was there on a Sunday around 1 pm. I decided to go with their signature Thai Wanton Noodle and I opted for the $4.50 portion, there is also the choices of $3.50 and $5.50 portion. I wanted to order their Fried Chicken Wing ($1.40 per piece) too but was told it is not ready yet. The Wanton Soup ($3 /$5 / $7) is also not available. I helped myself with the dried chilli powder placed at the counter. When the noodle was ready, I was asked, "Do you want the chilli?". I pointed to the saucer on my tray and said, "I already took some." He said, "It is a different type of chilli." He scooped some onto another saucer and handed it to me. 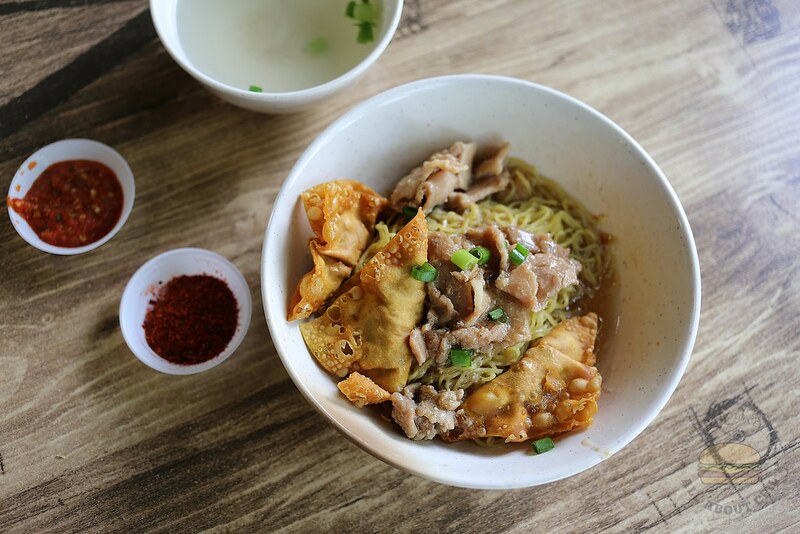 Their Wanton Mee does not come with the usual char siew but slices of stir-fried garlic pork and with only fried wantons, the portion of noodles was substantial. 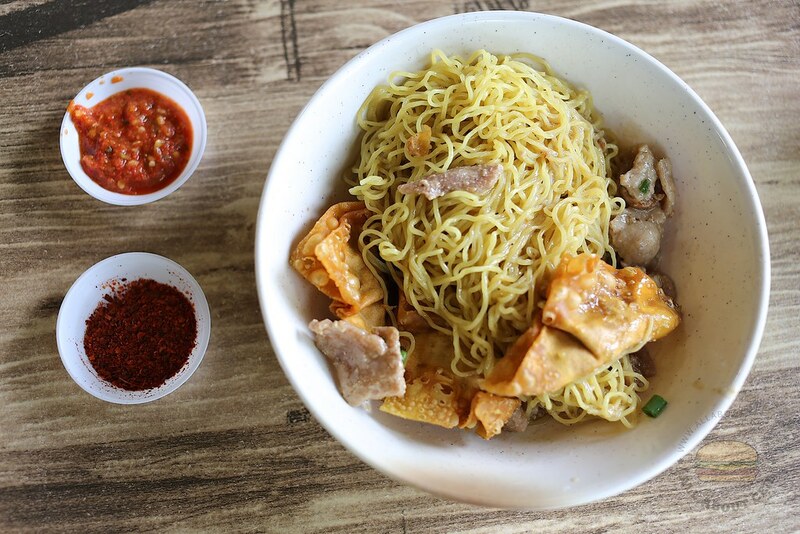 It did not taste like the typical Thai style Wanton Mee, it is different from Soi 19 Thai Wanton Mee at another part of Ang Mo Kio. It seemed to be quite dry but when looked closely, there was a pool of sauce underneath the noodles. I tossed it well and took a mouthful before adding in the dried chilli powder and mixed well, it actually tasted nicer with it. The handmade wantons are made daily, it consists of well-seasoned minced pork and it was deep-fried to the desired crispiness. The other chilli complemented the fried wanton rather well, a little spicy but quite addictive. My dining companion said, "It reminded me of those noodles served by Koo Kee Yong Tow Foo Mee. There is a certain similarity." He continued to say, "Those slices of pork were quite tasty too. Overall, it is quite nice." I actually prefer the other Thai style Wanton Mee that I mentioned earlier.